Celebrating 17 Seasons Of Theatre Arts Magic! 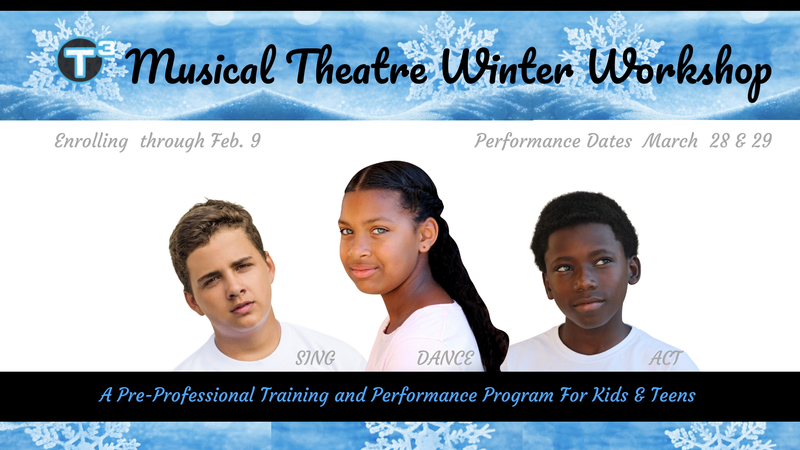 T3 believes the musical theatre experience begins in the classroom and culminates with a performance at the end of our sessions. This is our students chance to show what they have learned and perfect their craft. Through this process, T3 students come to learn that the same discipline, focus, and passion it takes to become a master performer are all the same things it takes to master your life. Click through to purchase tickets, sign up for our next series of classes or find out how you can help. Ticket prices are $10 for adults and $7 for youth under 17 (when purchased online – or $15 at the door.) Proceeds to benefit our 2019 spring program. On Thursday and Friday, May 28 & 29 T3 Triple Threat Youth Mentors will host their 2019 Winter Showcase. This informal performance allows our students to show what they have learned in class in a relaxed, supportive and loving environment. T3 performers will have the opportunity to show off their skills to their peers, family and community members.